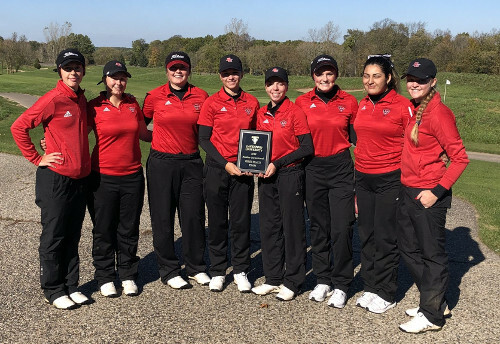 Rachael Rier from Hanover, Ontario shot rounds of 92-85 in extremely poor weather to help her Davenport University women’s golf team win its second tournament in a row. Rier finished 11th in the Panther Invitational, which was held at the Golf Club at Thornapple Pointe in Grand Rapids, Michigan - Davenport’s home course. Two Panthers - Frida Henningsson (79-84) and Karlee Hallberg (83-80), who was playing as an individual - tied for first but Hallberg won in a playoff. Only three teams participated in the tournament and Davenport, with a total score of 659, finished ahead of Lake Superior (664) and Purdue-Northwest (729). The Panthers also won their last tournament - the Mike Laeleff Memorial Invite at White Hawk Country Club in Crown Point, Indiana on Oct. 11-12. "What an awesome fall season! It was so nice to end it with a win at our home tournament on two days of difficult golf conditions.” states head coach Melanie Loughlin on the school’s website. “Off the course we have bonded and strengthened teammate relationships in such a positive way. The entire team culture has improved immensely! I'm looking forward to working on things this winter and having our team come out even strong in the spring!"